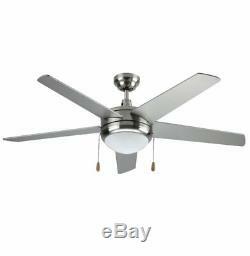 LB92100 LED Ceiling Fan, 50-Inch 5 Blade, Antique Brushed Nickel, 15W (65W equivalent), 3000K Warm White, 120° Beam Angle, 1000 Lumens, ETL & DLC Listed. 50-inch integrated LED Ceiling light fan, Uses only 15-Watts, 3000K Warm White, 1000 Lumen Output, 120V, 120° Beam Angle. Dimensions: 50"D x 12 1/4"H, Includes 4-inch down rod, 76-inch lead wire, and 15W integrated LED light that is equivalent to a 65W incandescent light. Add modern appeal to your home with this contemporary five-blade indoor ceiling fan, 3-speed reversible motor high/med/low, on/off pull chain controlled, 4 down rod. The streamlined design makes this fan ideal for low ceilings, and the five (straight) blade feature makes cooling down and moving abundant amounts of air easy. Built-in 15W LED Light, 4 down rod, 76-inch lead wire. The item "New Ceiling Fan Brushed Nickel 3-Speed Frosted Glass LED Light Indoor 5 Blades" is in sale since Monday, January 8, 2018. This item is in the category "Home & Garden\Lamps, Lighting & Ceiling Fans\Ceiling Fans". 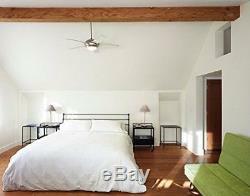 The seller is "lightingpartners718" and is located in Brooklyn, New York. This item can be shipped to United States, Canada, United Kingdom, Denmark, Romania, Slovakia, Bulgaria, Czech republic, Finland, Hungary, Latvia, Lithuania, Malta, Estonia, Australia, Greece, Portugal, Cyprus, Slovenia, Japan, Sweden, South Korea, Taiwan, South africa, Thailand, Belgium, France, Hong Kong, Ireland, Netherlands, Poland, Spain, Italy, Germany, Austria, Bahamas, Israel, Mexico, New Zealand, Philippines, Singapore, Switzerland, Norway, Saudi arabia, United arab emirates, Qatar, Kuwait, Bahrain, Croatia, Malaysia, Brazil, Chile, Colombia, Costa rica, Dominican republic, Panama, Viet nam, Uruguay.